For South Florida divers, the beginning of August means that Lobster Fever is now in full effect! From novices to old pros, divers across the state are gearing up with their tools-of-choice (tickle sticks, snares or nets) and heading out with high hopes of bringing home a few of these tasty tails. With lobsters’ sweet, buttery flavor, it’s no wonder that divers are eager to make their first catch. 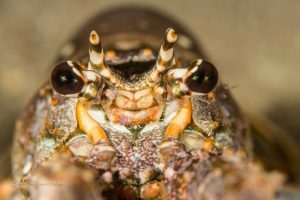 While Caribbean Spiny Lobster, or Panulirus Argus, began to grace dinner plates as early as the 1800’s, lobster fishing only began to gain traction with recreational SCUBA and skin divers around the 1950’s. Since then, lobster fishing has expanded exponentially, with Florida’s commercial lobster industry providing 99.9% of the total Spiny Lobsters caught in the United States in 2014, according to the Florida Department of Agriculture. 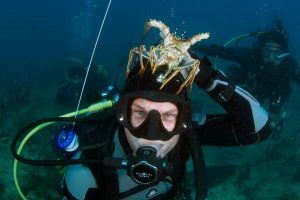 - Every recreational SCUBA diver catching lobster is required to hold a valid Saltwater Fishing License with a Crawfish Permit. Fishing licenses can easily be purchased online. - A lobster’s carapace (the top section of its body) must measure at least 3 inches in length. Each diver is required to carry a gauge while in the water, and measure their catches before bringing them to the surface. - To measure your lobster, place the gauge firmly between its eyes and ensure that the carapace extends beyond the 3-inch mark of your gauge. - In addition to a 3-inch carapace, a lobsters’ tail must measure 5 inches in length. Force-E’s double-marked metal gauges are a great tool to ensure that your catch meets size requirements. - The catch limit of Caribbean Spiny Lobsters is 6 per diver per day. Some Florida counties, like Monroe County, have additional regulations, so be sure to check out myfwc.com before planning your next lobster-catching adventure. Florida Lobster Season runs from August 6th through March 31st. Eager to get in on the craze? Stop by your local Force-E store to pick up everything you’ll need, and talk to our knowledgeable crew to get their firsthand tips and tricks for bringing home a bug. Want to enhance your lobster catching experience even further? Sign up for our hunting or Peak Performance Buoyancy specialties to perfect your SCUBA skills.